Carol Purington has been writing haiku and tanka poems since the early 1980s. Her works have appeared in many English-language haiku/tanka publications, both print and online, and they have won recognition in international contests. She has published two books of haiku (Woodslawn Farm and Family Farm) and three books of tanka (The Trees Bleed Sweetness, A Pattern for This Place, and Gathering Peace). Carol lives on a multi-generational farm in Colrain, Massachusetts. Susan Todd graduated from Smith College and is the mother of three grown daughters. She was an elementary school teacher for many years before becoming head of the Heath School in Heath, Massachusetts. She was a founding editor of Parents’ Choice Magazine and a contributing editor of FamilyFun Magazine. Her retrospective on Laura Ingalls Wilder appeared in the Atlantic Monthly. In the early sixties, during the Mad Men era, she was an advertising copywriter at Doyle, Dane, Bernbach in New York. Susan lives in Ashfield, Massachusetts. There was a blizzard the day Carol Purington and I began reading poetry together. The storm began in the afternoon, as my work was ending at the Colrain Central School where I taught sixth grade. I finished organizing my classroom, and with the wind whipping the snow against my windshield, I drove the few miles to Wilson Hill Road, where Carol lives on her family’s farm. My car slowly climbed the hill to a colonial farmhouse and a red barn set in a sweep of white fields. When I knocked on the back door leading into the kitchen, I was met by the stunned faces of Carol’s parents. Why would anyone go out in this weather to read poetry? In the small rural community of Colrain, Massachusetts, Carol was a legend, revered by her neighbors. When I first came to teach in this town, distinguished by its family farms, of which the Puringtons’ was one of the oldest, I heard a great deal about her. The first grade teacher down the hall told me about Carol’s life as a poet and about her disability, caused by the last polio epidemic in 1955. I asked many questions and my fascination grew. Over the years I taught several of her nephews, and one of them brought me her first book, a volume of haiku called Woodslawn Farm, which I read many times. One year I arranged a field trip to the farm and was able finally to slip into her room, the original front parlor, and say hello. I knew from that moment that I wanted to be her friend. Years passed before the possibility for friendship arrived. 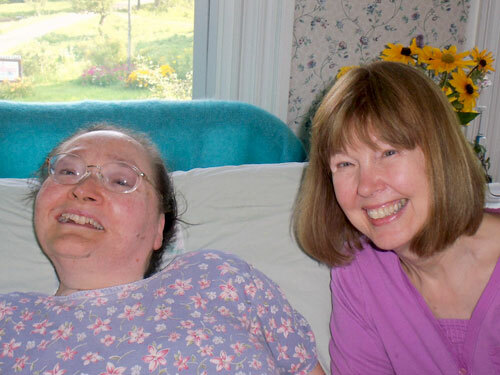 Around Christmas my co-teacher and I paid Carol a visit before a class trip to sing to her. We wanted to acquaint ourselves with her room, crowded with equipment and lined with bookshelves, so we would know where the children should stand. We talked a bit and out of the blue Carol said to me, “We’re all so impressed that you knew Robert Frost.” (I met Frost in the last years of his life when I was a freshman in college – a story I always told my students before reading his poetry.) And then she added, “I should really go back and re-read his poems.” That was the line I must have been waiting for. “If you want someone to read Frost with, I’d like to be that person.” We set a date in the new year. Before the singing trip I told my students Carol’s story, trying for simplicity and clarity. She contracted polio when she was six years old, as she was starting first grade. The illness began at school with a severe headache and high fever. Within days she was left needing help to breathe, and paralyzed except for limited movement in her left arm and hand. She spent a couple of years in Boston area hospitals where her most memorable accomplishment was learning to read. Eventually she moved back to the big farmhouse where she had been born, the third of eleven children. She lives there still, surrounded by a large and caring family. Carol’s formal education was made possible by tutors and intercoms between her home and school and college classrooms. Over the years exploration of the world, through fiction, poetry, and nonfiction, has broadened her learning. Her reading is done now primarily through audio books: her computer is voice-activated. In the past 30 years she has published eight books – of haiku, tanka, and prose. “When the day for Susan’s first poetry visit coincided with a serious January snowstorm, my family and I assumed that she wouldn’t even consider driving up our hill in such weather, so I didn’t call and suggest that we change the date. We were wrong, and promptly at 4 p.m. Susan drove into our dark and drifting yard. “Just to make the harrowing expedition seem worthwhile we read a token few of Frost’s poems. ‘Death of a Hired Man’ would come later, along with T.S. Eliot and Hopkins and Aeschylus and Wilbur and countless others. After a few minutes my father, who is not a man to worry, gently requested that she call us when she reached home, 22 winding miles away. And she did. “According to Dad’s weather records, Susan’s first visit to read poetry took place on January 8, 1996, during a blizzard – 15” snow, a low temperature of 8° and a high temperature of 11°, with a maximum wind measurement of 25 mph.